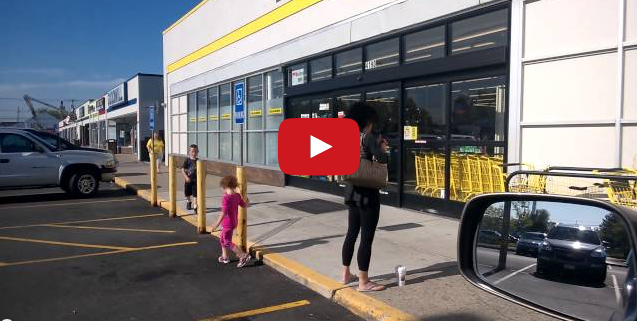 Woman’s Racist Tirade At Dollar Store Goes Viral. It’s amazing that in the year 2014 we still have to deal with racism. A woman outside of a dollar store in New York really shows her true colors when she verbally attacks a black man in front of her two small children. Over and over again she shouted racial slurs calling him “A nasty F*cking N*gger”. This woman was an absolute moron. Calling him every name in the book, putting him down, all in front of her two small children. Mother of the year? I don’t think so. A YouTube user named IAMOYAB posted the video of himself sitting in a dollar general parking lot arguing with a woman who he said started calling him the N-word just because he started his car. He currently has over over 9,600,000 YouTube views for this video. A Reddit page with over 10,000 comment had been shut down after users posted personal information about the woman.